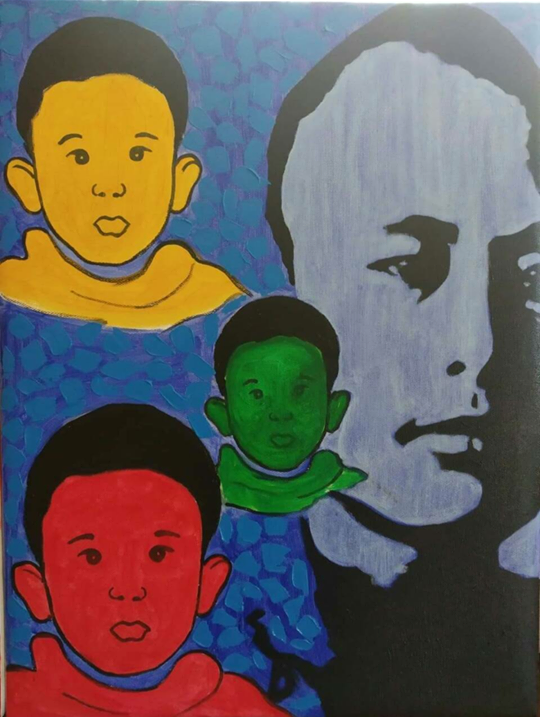 YANGON — While artists MPP Ye Myint and Han Kyaw Moe commemorate the 104th birthday of independence hero Aung San with a new show, Myemone Lwin, the founder of Yangon Book Plaza, is marking the occasion by opening the We Creation art gallery to host it. 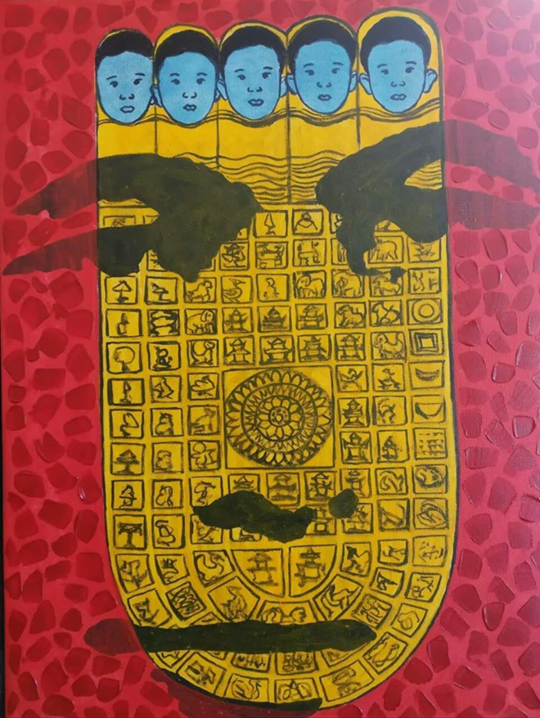 Mingalarpar 104 will show through Sunday at We Creation, at the Yangon Book Plaza, Thazay Market, Lanmadaw Township. MPP Ye Myint and Han Kyaw Moe have brought their own perspectives on the life of General Aung San to the show. One of the paintings by MPP Ye Myint brings the general to life with rough brushstrokes and an excerpt from one of his fiery speeches. 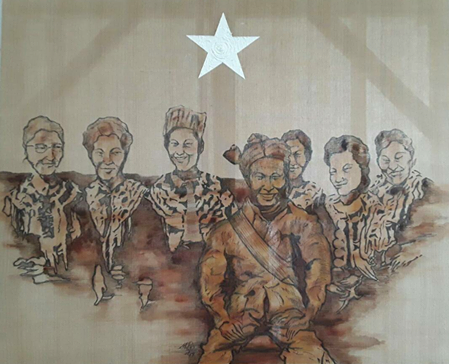 Portraits drawn with a CD pen on pin-ni cloth woven from fawn-colored cotton reflects the political dignity of the general and the trust and love he engendered among ethnic minorities. “Pin-ni is a Myanmar tradition. His portrait matches perfectly with pin-ni cloth. I don’t mind that it isn’t durable. The essence is about artistic freedom,” said MPP Ye Myint. Han Kyaw Moe focuses on Gen. Aung San’s family life with his daughter Daw Aung San Suu Kyi, Myanmar’s serving state counselor and de facto leader. 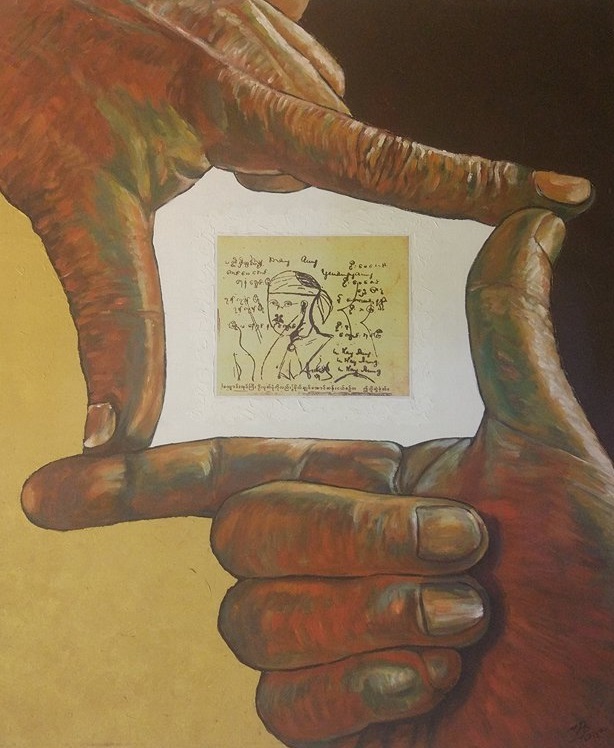 His paintings represent the pair’s efforts and sacrifices in the name of peace. 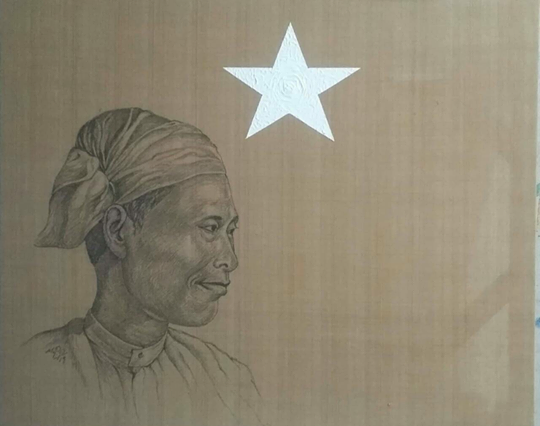 Gen. Aung San was a critic of the journal and periodical illustrations of his time, a patron instead of military paintings at a time when Myanmar was under colonial rule. 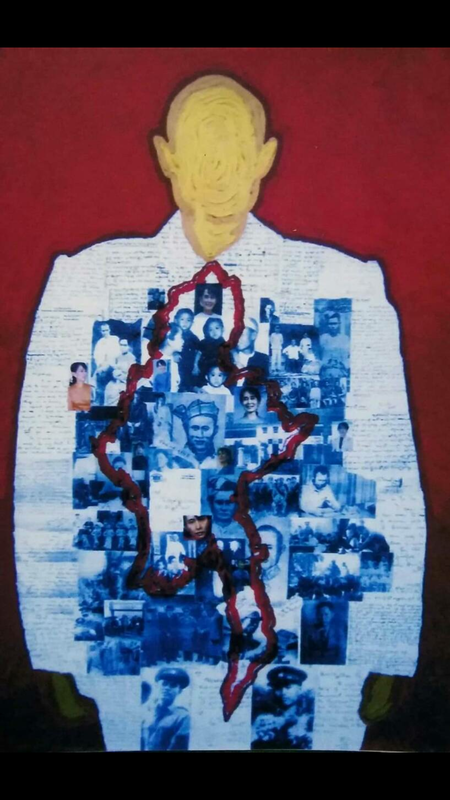 According to the records of author Tekkatho Ne Win, who served as an aide to Aung San, the general was fond of the painting “Shwe Taung Battle” by U Ngwe Kaing. More than 50 paintings will be on display at Mingalarpar 104, with prices ranging from 200,000 kyats to 2 million kyats. 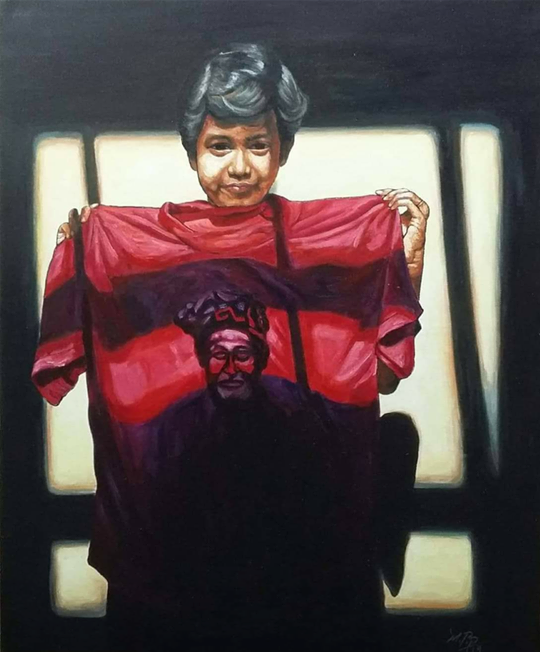 This is MPP Ye Myint’s and Han Kyaw Moe’s second joint exhibit. They also showed together four years ago to mark the centenary of the general’s birthday. 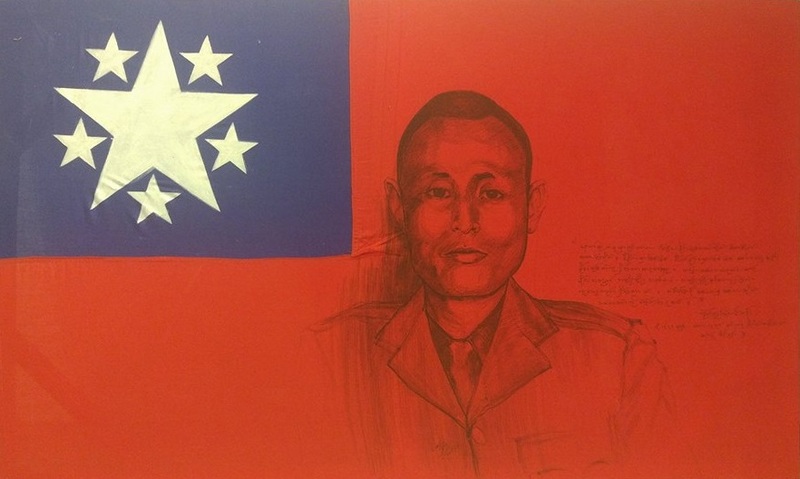 The gallery will serve visitors free boiled peas and Indian flat bread, and the first 100 will get postcards featuring paintings created by Gen. Aung San when he was young. Books about the general will also be on sale.